LP360 for sUAS is a specially-designed drone 3D mapping software. LP360 for sUAS makes easy work of extracting information and derived products from data collected by small Unmanned Aerial Systems (sUAS, UAVs, drones). LP360 works with point clouds derived from LIDAR systems as well as Structure from Motion (SfM, dense image matching, point clouds from imagery, multi-ray, photogrammetry) point clouds. 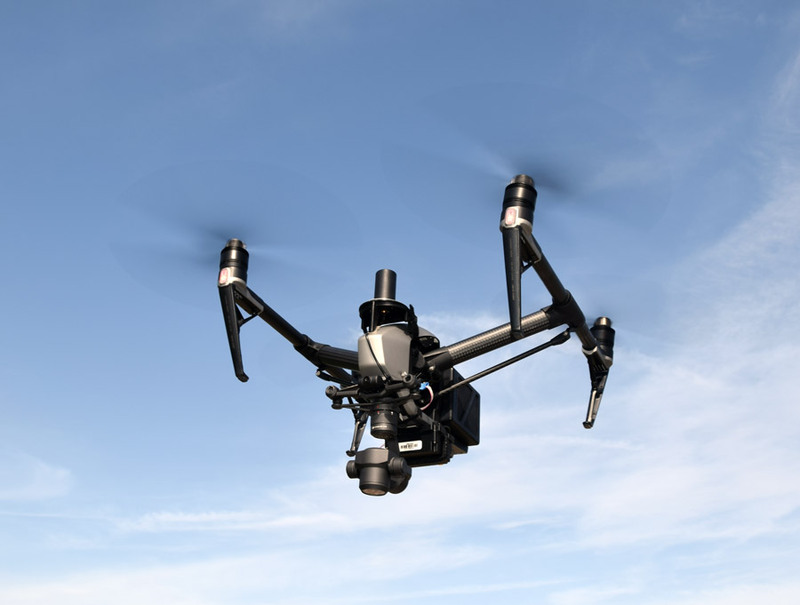 For drone 3D mapping collecting and processing, LP360 picks up where other point cloud generation tools such as PhotoScan and Pix4D leave off. LP360 has a very rapid Return on Investment (ROI), paying for itself within just a few stockpile edit sessions. LP360 for sUAS is the most comprehensive solution available for analyzing and extracting value from point clouds generated using products such as Pix4D Mapper and PhotoScan Pro (both sold and supported by AirGon LLC). Based on years of experience with photogrammetry and LIDAR tool development, LP360 gives you the confidence that you are delivering products of the highest integrity to your customers. Planning and flying the mission is performed with either proprietary software provided by the sUAS manufacturer or with an open source package such as Mission Planner and APM Pilot. The process of orienting images and generating a point cloud/orthomosaic is performed with a commercial point cloud generator such as Pix4D Mapper or Agisoft’s PhotoScan Pro (both of which are sold and supported by AirGon LLC). Quality Assessment, Analysis and Derivative Product generation are performed with LP360. 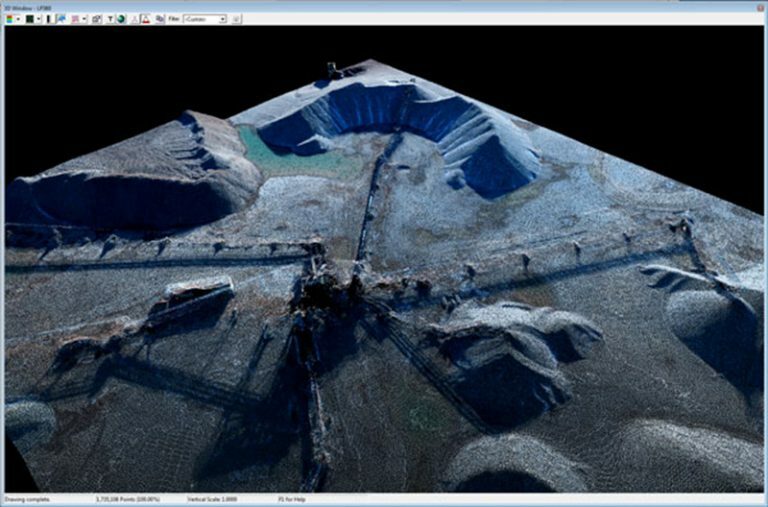 Initial quality assessment is performed with tools provided by the point cloud generation software (e.g. PhotoScan or Pix4D) to ensure that full data coverage has been achieved and that the image orientation process can converge to a solution. Following this initial processing step, the data (both the derived point cloud and the orthomosaic) are imported into LP360. 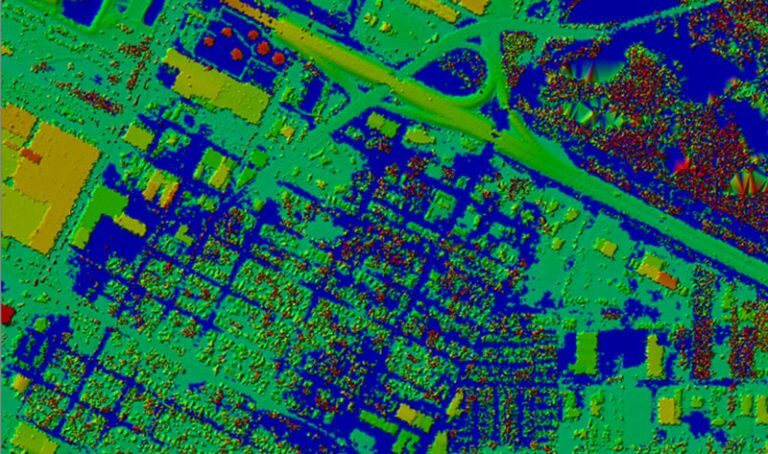 If using LIDAR, these data are directly ingested from the LIDAR vendor’s post-processing software. LP360 includes an extensive collection of visualization modes and tools. Comprehensive visualization is a core element of the exploitation environment both for inspection and for quality assurance. Image derived points can be displayed by intensity, color value, elevation and classification. LIDAR data includes the additional modes of Return, Scan angle, and Point Source ID. Modes such as Classification can be modulated by intensity, a feature essential to interactive classification. Rendering modes include points, a surface model triangulated irregular network (TIN), wireframe and combinations of points on surfaces. Surface “sun” shading is also supported. Contours are dynamically generated and displayed. Viewing windows include plan (map) view, profile (cross section) and 3D. There is a free Viewer available that you can deliver to your customers, allowing them to experience the rich value of point cloud/ortho data. LP360 includes tools for testing both the horizontal and vertical accuracy of point clouds and orthomosaics. Without a 3D visualization environment, vertical errors are very difficult to assess. 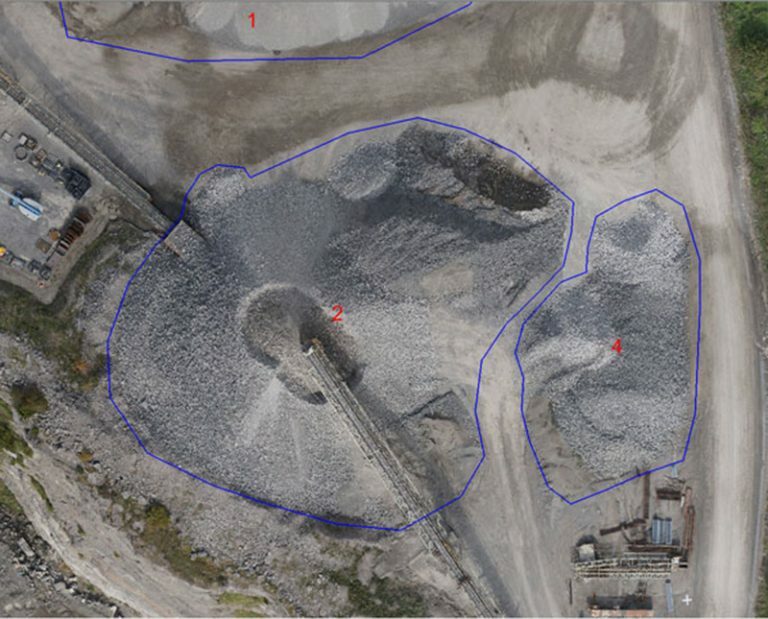 Complete visualization and reporting, in accordance with the 2014 ASPRS Accuracy Specification, are provided. A report generator is included, allowing you to deliver an accuracy report as part of the customer deliverables. LP360 includes interactive tools for “classifying” data in both the Map View and Profile Views. Classification sets an attribute tag on points that designates their feature class (e.g. ground, vegetation, building, overhead structure and so forth). Classification of data is an important data preparation step prior to volumetric analysis and ground digital elevation model (DEM) generation. For example, conveyor systems overhanging stockpiles are automatically classified prior to volumetric analysis to allow them to be excluded from the volume computations. In addition to interactive tools, LP360 includes tools to automatically classify ground and planar surfaces such as roof tops. LP360 also includes utility “Point Cloud Tasks” for classifying height above ground, moving one class to another class and generating classification statistics. 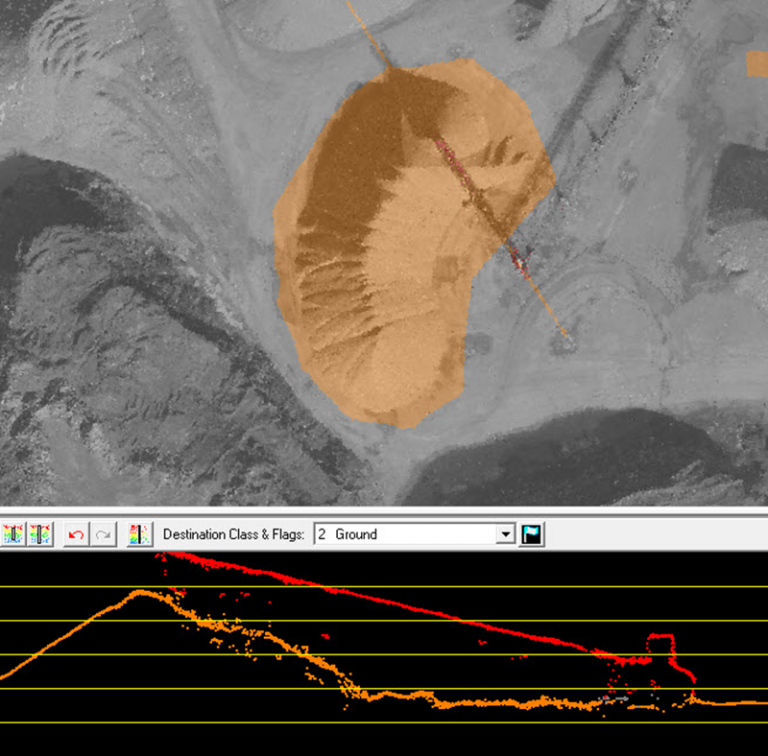 Mine sites and other similar sites typically require extensive 3D editing of feature definitions for accurate modeling; for example, sketching the base between mixed stockpiles. 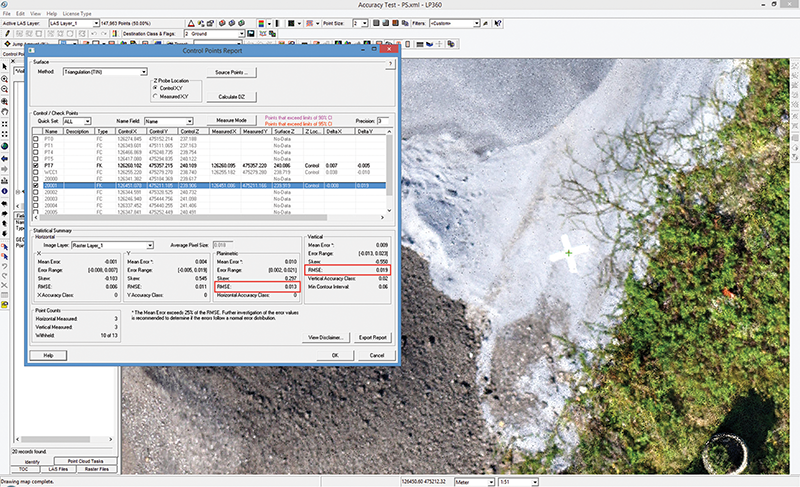 LP360 contains a rich set of intuitive 3D edit tools to make short work of these tasks. LP360 includes a complete tool set for volumetric analysis. These tools allow you to define the “toe” of a volume calculation with a variety of methods from an automated extraction algorithm to interactive sketching, to predefined definition files. Volumes can be computed using defined bases or between point clouds (for use in time change analysis). The reports include tabular data as well as the ability to generate output point clouds that represent the volume area (for example, a point cloud of a stock pile). Cross sections can be extracted from point clouds using a variety of “alignment” definitions. The cross sections can be of a user specified length or clipped to enclosing polygons. LP360 includes advanced contouring tools that allow for both interactive visualization (dynamic contouring) and generating file-based contours for customer delivery. LP360 includes an extensive set of tools for creating derivative products. The digital elevation model (DEM) tools allow the user to set grid spacing and interpolation methods. Project-wide contours can be exported at user specified intervals and labeling. 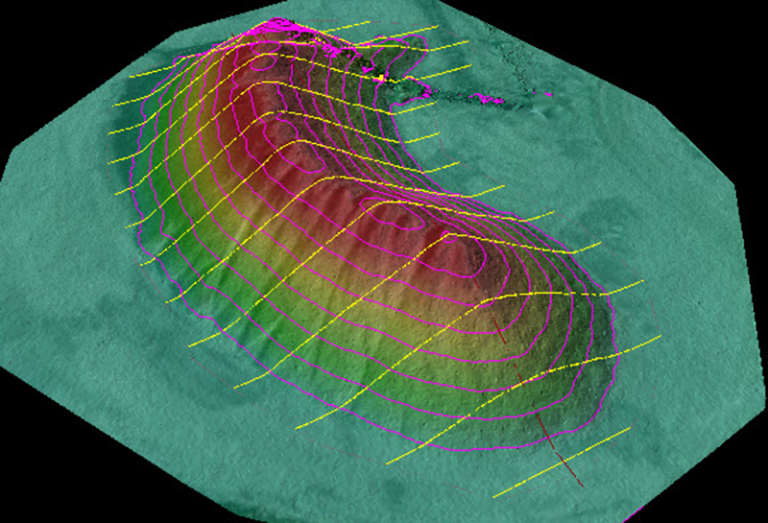 Additional products include slope, aspect, hill shade and intensity rasters. 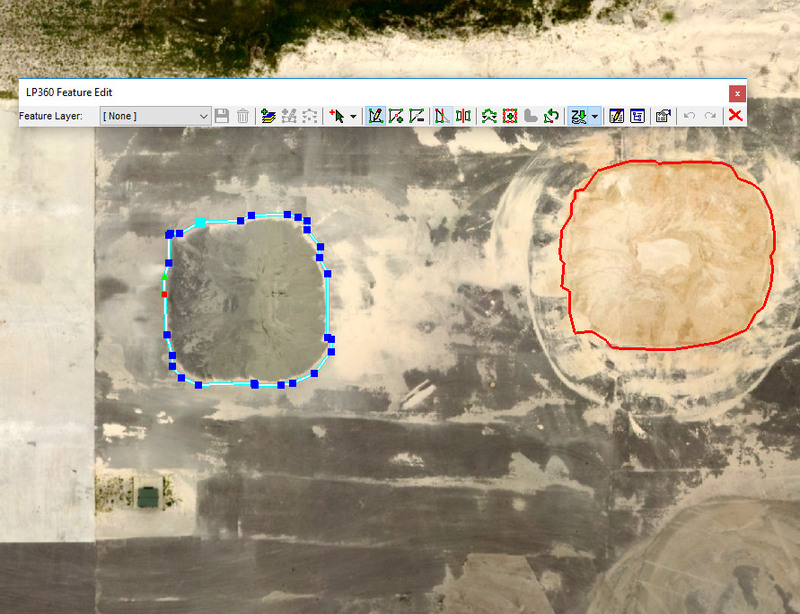 LP360 for sUAS is a 64-bit standalone Windows application that can work on projects containing point clouds that cover up to 4 square kilometers (about 1,000 acres). Projects of virtually unlimited size can be managed by upgrading to LP360 for sUAS Unlimited. Both versions include an ArcGIS® extension that provides a subset of functionality in ArcGIS desktop.